I wanted to reach back in Pune before it was too dark - and I wanted to have a very peaceful sleep before I head back to Bangalore on Monday morning. 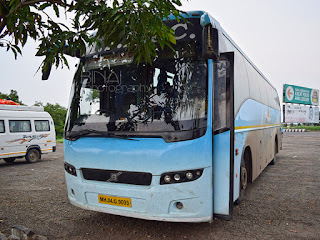 I had the option of taking a private Volvo, or trying my luck in the long distance Volvos that operate out of Shirdi towards places in the South. I ruled out both, and briefly thought of taking a non-ac bus through to Pune from Shirdi. 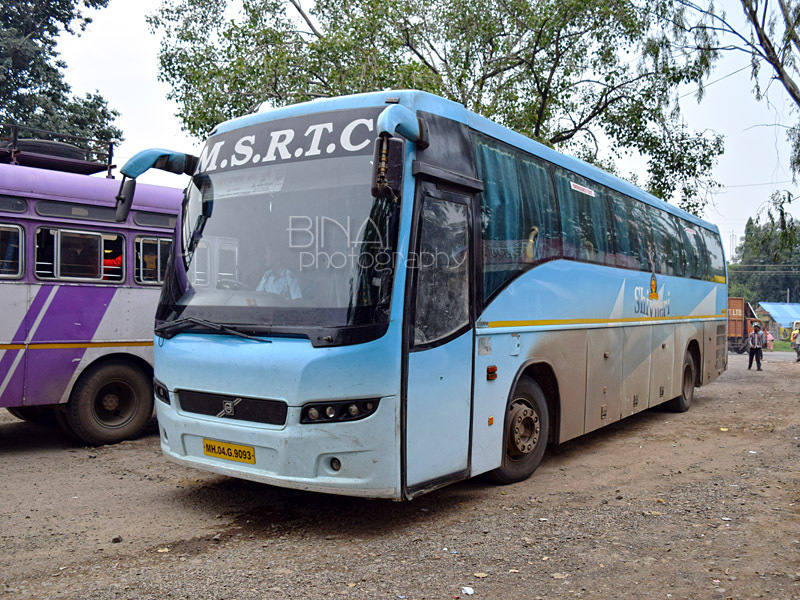 The lure of travelling in an MSRTC Shivneri after long 8 years kept me in suspended animation. 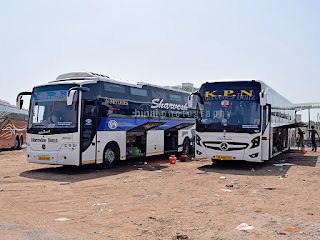 Since there were no direct Shivneri services to Pune from Shirdi, I had two options - one, to go to Nashik and take a bus from there to Pune (adds to my travelling distance and time), second - to catch a Shivneri from Ahmednagar (Nagar) - this was the most feasible of options. The MSRTC online reservation website is a bit confusing - it doesn't show the pick-up timing at your pick-up point when you search for buses. On searching for Shivneri buses from Nagar to Pune, a list of 15 services popped up - I initially thought the timings shown were for pick-up from Nagar. The timings that popped up were a bit unfeasible to me - but out of curiosity, I opened the detailed stops list and realised that the timings shown were the time at the service origin. I finally picked a bus that would pick me from Nagar at around 3pm - this bus would leave Aurangabad at 1300hrs, and the ticket mentioned a pick-up time at Nagar, of 1515hrs. This meant I could leave Shirdi around 1100hrs, have lunch at Nagar and still have some buffer time for my onward bus. 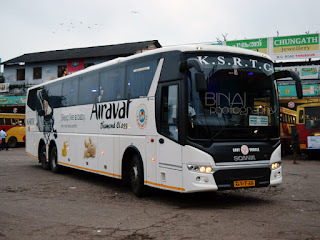 Shivneri is a brand used by MSRTC for their premium luxury lineup of buses. The brand name was first used sometime in 2002, with the initial services operating on the Dadar - Pune route. Volvo B7R coaches with a blue colour scheme was used for these services. Although a lot of routes were tried, the services succeeded only in a few, and they grew strong on those routes. The Pune-Aurangabad was one such route. The Shivneri services were unique in the fact that they generally operated without conductors (except the long routes), and one had to purchase a ticket before hand and then enter the coach. After a very contenting darshan at Sai Baba's samadhi, I came back to my room to take some rest. On my way back from the temple, I quickly checked the availability of buses to Nagar from Shirdi - I was told, they are available in plenty. The crowd was average as well - so I had no reason for worry. I checked out of the hotel room by around 1100hrs, and crossed the road to reach the bus station. Since I had baggage with me, I had to ensure I get a seat in the bus. 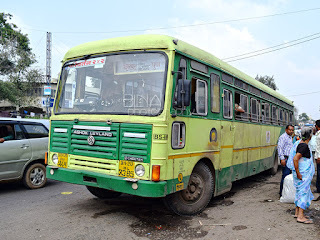 The busfan in me also wanted me to travel in an "Ordinary Express" bus of MSRTC - which is the lowest class of service (by fare) operated by MSRTC. I also wanted to travel by a newer bus. Sometime around 1130hrs, a green coloured bus pulled in, with a board reading Pune. 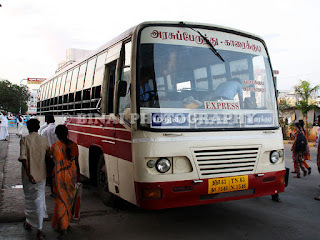 I checked with the conductor if it would go to Nagar, he replied in affirmative, and I got into the bus. Only the last row was available - although that means a rough ride, I decided to go ahead. 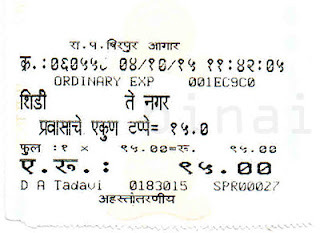 The Ticket - its entirely in Devnagri, including the total fare. The fare was Rs. 95. Interiors of the bus. The bus had 2x2 seating with fixed back. The bus, MH20BL3385 of Shirpur depot, was working a Shirpur-Pune schedule. We started off from Shirdi at 1136hrs. The, approximately, 90kms ride cost me Rs. 95. The driver was fast from the word go. The bus kept making stops every 20 minutes or so - all the stops were at bus stations en route. My phone kept recording speeds in the range of 80kmph most of the time, and the roads were mostly 4 laned. The stops en route were all very brief, except the stop at Rahuri - where we stopped for 11 minutes. Amazingly tasty Vada Pavs were sold at Rahuri. I was finally dropped outside the Ahmednagar Maliwada CBS at 1332hrs - 4 minutes short of two hours from Shirdi. I was bemused since the bus did not enter the bus station, but stopped outside on the road itself. The bus that I traveled in - MH-20-BL-3385 of Shirpur depot. I had close to two hours to go for my next bus - I headed for a relaxed lunch - I gobbled up about an hour at the restaurant itself. I headed to the bus station next - I was still intrigued about why majority of the buses weren't entering the bus station. Only local route buses entered the bus station. The person at the enquiry counter replied incoherently when I asked him about the pick-up point for my bus. Finally, a person at the reservation counter explained in detail that my bus would come at a bus station about 200 metres way from this bus station, and I had to go there. I walked up to that bus station, and realised that all long distance buses call on at that bus station, not the one I went earlier. My Shivneri, MH-04-G-9093 arriving at Nagar. The scheduled time for my bus was 1515hrs. I had no idea where the bus would park, and hence waited near the entrance for buses. My bus appeared at 1524hrs - it headed directly to a platform. 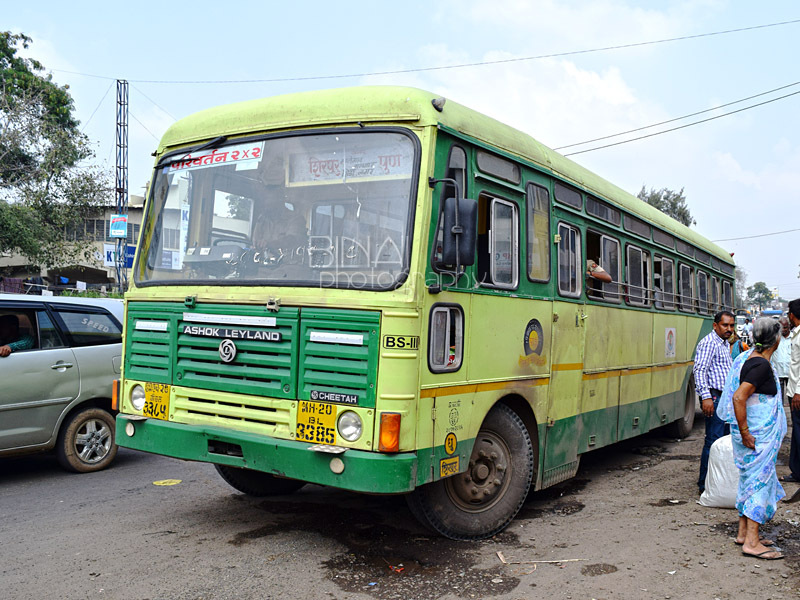 Soon after it stopped a uniformed MSRTC employee, with a ticketing machine got into the bus and checked for availability of seats. Two reserved passengers (including me) were joining at Nagar - he quickly checked our tickets and let us in. There were no empty seats and many seat seekers had to be sent back. The overhead racks were full, and I had to do a bit of juggling around to leave my bag there. We started from Nagar at 1532hrs. The driver was calm and was slow initially. We pulled into a roadside motel, Smile Stone, for a break at 1556hrs. There were huge boards outside the hotel announcing that the place was an authorised break for Shivneri buses. I did not want to eat anything, since I had taken a fairly heavy lunch. Hence, it was just walking around for sometime, and clicking some pics. In the meantime, another Shivneri (heading to Aurangabad from Pune) joined us at the motel. Since the AC was left on during the break, I got back into the bus soon after. We started from there at 1621hrs. The driver meant business now - he maintained great pace from there on. It started raining as we neared Pune - the rain got heavier as we went closer to Pune. The maintenance of the bus wasn't great - water slowly started leaking through the glass pane. Traffic got thicker as we neared the city. It was absolute chocked as we neared Viman nagar - rain only added to our misery. The bus kept stopping on the way to drop passengers - I couldn't note down the landmarks. The only place I instantly recognised was Pune Station - we dropped some passengers there at 1824hrs, and continued towards Shivajinagar. We crawled through traffic, and finally reached Shivajinagar bus station at 1834hrs - a whole 94 minutes late. Interestingly, the bus headed straight to the platform, since it was already late for its return departure! 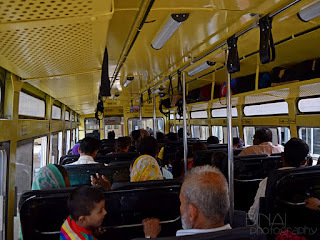 Summary: The ordinary bus journey was really enjoyable - what really left me surprised was that the interiors haven't changed even a bit from my last experience in 2008. Shivneris continue to be the good ol' no-nonsense service. No entertainment is played. The bus has only 1 crew member - the driver. No attendant or conductor is on board. The bus I traveled in, MH-04-G-9093, had clocked about 9.13 lakh kms, and did show its age. The maintenance was very average - no rattles, but leaking window pane is not acceptable. The bus wasn't very clean either. Driving was great - no hard brakes, or rash maneuvers. Overall, it was a good experience. I must add this - there is no time savings, and its better to travel by the direct bus all the way from Shirdi to Pune. It isn't worth wasting time changing buses at Nagar.